What would you do with free rent for a year? 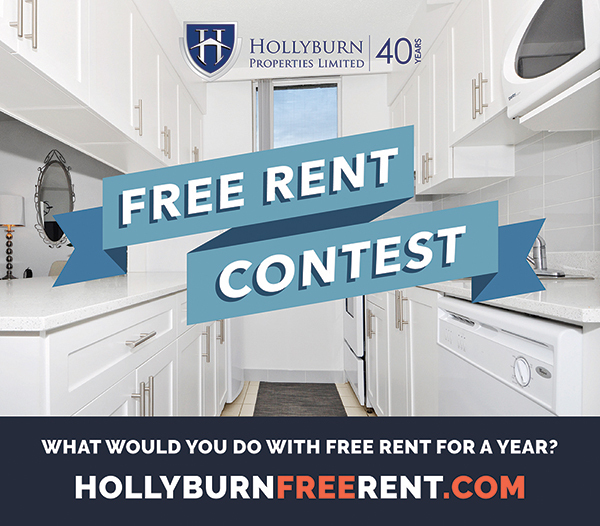 Hollyburn Properties is seeking to reward one lucky person with free rent for a whole year in a premier one-bedroom Hollyburn apartment in Vancouver, Calgary, Toronto or Ottawa! Celebrating 40 years of building rental communities across Canada, our family-run company actively supports a mission of community service and outreach. The Hollyburn Free Rent Contest is launching TODAY to celebrate those individuals in Canada who are likewise dedicated to social impact through community involvement. Participants must describe how they, or someone they know, contribute to building their community. Do you volunteer? Are you involved with a non-profit? Have you founded an innovative social initiative? The criteria are simple; the impact must be authentic, compelling and inspirational in nature. It can look like a lot of different things to different people. We want to reward one deserving person with free rent for a year who is committed to building up their community through personal connection and leadership. For details and guidelines, watch our YouTube contest video, and visit the Hollyburn Free Rent Contest website: www.hollyburnfreerent.com. Good luck!